LURAY, Va. - Some years ago, my husband and I set out on our great honeymoon adventure. Our three-day drive from Pittsburgh to jobs in Miami would take us through Virginia's picturesque Shenandoah Valley. To humor my father, we agreed to stop at Luray Caverns. 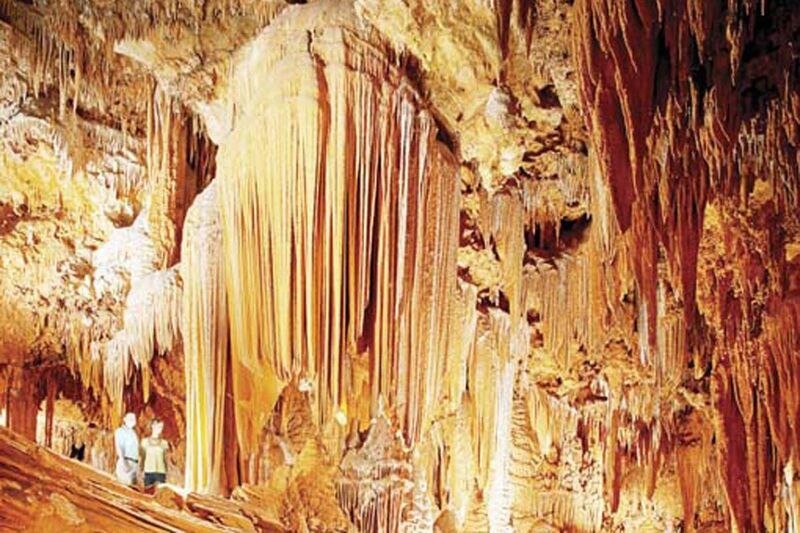 Discovered in 1878 and named a National Natural Landmark in the early 1970s, the 64-acre series of subterranean rooms and passageways is remarkable. There's something magical about being 160 feet below the surface, where the temperature is always 54 degrees, and still feeling dwarfed by nature; some of the cavern's dimly lighted rooms soar 10 stories. And how cool is the cavern's sparkling Dream Lake, which reflects myriad stalactites hanging from the ceiling? We knew that some day we'd be back. That day arrived recently, after dropping our daughter off for her sophomore year at James Madison University. It proved just as much fun as the first time. We started our trip in scenic Harrisonburg, home to the university. Known as part of the "Breadbasket of the Confederacy," it's a must-see for history buffs interested in Civil War battlefields and historic sites such as the Hardesty-Higgins House, used briefly as headquarters of Union Gen. Nathaniel Banks. It's equally popular with bicyclists, thanks to multiple mountain-biking trails, and also a boon for foodies, who have dozens of restaurants to choose from in the state's first designated culinary district. Add three craft breweries, a cider house, and a pair of wineries to the victual delights. After moving our daughter into her dorm, we saluted the fall semester with a terrific lunch of pulled-pork and cheese grits at Clementine Cafe on South Main Street, which is also an art gallery and live-music venue. Bidding Olivia a teary goodbye, we drove a half-hour south to Staunton. It's hard to imagine a small town more charming than Staunton (don't make the mistake we did - it's pronounced "STAN-ton"), home to Mary Baldwin College and the Woodrow Wilson Presidential Library and Museum. It's extremely walkable and postcard pretty. And talk about things to do: Its six-block main street bustles with antiques shops, art galleries, restaurants, coffee shops, and quaint boutiques. It has also been a boon for theater lovers: The American Shakespeare Center houses the world's only re-creation of Shakespeare's original indoor theater, the 300-seat Blackfriars Playhouse. It's next to the historic Stonewall Jackson Hotel, where, after checking in, we made a beeline to chef Ian Boden's much-lauded 26-seat restaurant, the Shack. We didn't have time (or reservations) for the $45 prix fixe menu, but we noshed al fresco on pimento cheese and pork cracklins. We then clapped and hooted our way through a lively production of A Midsummer Night's Dream. And neither of us thought we liked Shakespeare. On Saturday, my husband talked me into visiting Bruce Elder's antique/classic-car museum, housed in a 1911 Ford dealership building. For $5, we got to see two floors of more than 50 cars, including Richard Petty's 1987 Pontiac Grand Prix Winston Cup Race car and a 1911 Chalmers Model 30 with wooden-spoke wheels. As payback, I insisted we do a craft-beer tasting ($10 for four) at Redbeard Brewing, a small-batch brewery on Lewis Street. On our way out of town the next day, we stopped for burgers at the nondescript Marino's Lunch on North Augusta Street. A fave with locals, it has been a beer joint and bluegrass hot spot for more than 100 years. Staunton is just a few miles from the Rockfish Gap entrance to Shenandoah National Park's Skyline Drive, where the $20 per-car entry buys you seven days on the 105-mile drive. If you plan on hiking, ask the park ranger at the gate for trail maps; they're marked with elevation, distance, and effort level (easy to challenging). We did two hikes during our stay: the 2.2-mile loop to the Turk Mountain Overlook (harder than it looked) and the 1.6-mile Stony Man Trail partway along the Appalachian Trail to Stony Man Summit, Shenandoah's second-highest peak at 4,010 feet (easier than we imagined). If you plan on going point to point by car, know that the 35 m.p.h. speed limit makes for slow driving. Sometimes infuriatingly so, as drivers pull on and off for the drive's 75 overlooks. We thought the views of the rolling piedmont to the east were more spectacular than those of the Luray Valley to the west, but they're all Instagram-worthy (even if you can't immediately post them due to poor cell service). If you're going to spend the night on the drive, there are only three options: Lewis Mountain Cabins, Big Meadow Lodge (where you'll find the Harry F. Byrd Visitor Center), and Skyland Lodge, where we enjoyed views from the highest point on Skyline Drive from the comfort of our room. A word of caution for you impatient types: Though the resort regional fare was very good, the restaurant can be extremely crowded on weekend evenings. Expect a wait. Another long queue is in store if you don't get to Luray Caverns early; by 11 a.m., the line already was snaking out the door. The hour-long tour, though, is lots of fun. Be sure to rub the "eggs" on the way out - the only parts of the cavern you are allowed to touch - for good luck. Admission to the caverns includes the Car and Carriage Caravan Museum, but we opted instead for the adjoining Luray Valley Museum (also free) to learn about local history and see artifacts from the 1750s to the 1920s; the museum also includes a seven-acre re-creation of a small 19th-century farming community. Still have some energy? Kids will love the Garden Maze ($9 adults, $7 ages 6-12), and who can say no to a tasting of local wines in the 1860 Burner Barn (weekends only through fall)?